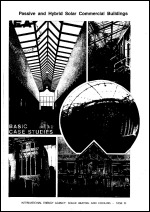 The results of research performed by solar experts from twelve countries during the years 1986 to 1991 are presented here, featuring forty-five building case studies. Researchers in participating countries of the IEA Task XI of the Solar Heating and Cooling Programme have been studying real buildings which employ passive and hybrid passive/active solar strategies designed to reduce use of non-renewable fuels. The basic strategies used to achieve this end have been devided into four categories, the first three being, HEATING, COOLING and LIGHTING. The fourth category is dedicated to the increasingly popular ATRIUM which often provdes a combination of passive heating, cooling and lighting. 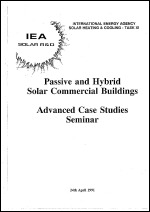 A collection of 48 case studies of passive and hybrid solar commerical buildings from12 countries and the CEC is presented, covering a wide variety of building types, climates and locations. Generalisations, concerning building performance are more difficult, and sometimes impossble, due to the diversity of buildings, systems and climates.